Caribbean countries desperate for tourism revenue could lose more $600 million because of the two hurricanes that swept through the region earlier this fall. The chairman of the council of ministers of the Caribbean Tourism Organization this week downsized the expected growth in tourism for the region to a mere one or two per cent for the rest of 2017 and continuing into for 2018. That’s a huge – and expensive - drop from what they had expected. And one that will hurt families across a wide swath of the region. The Caribbean recorded 16.6 million international tourist arrivals in the first half of this year, some 800 thousand more than in the first six months of 2016, he said. Up to the end of June, the European market had grown by 7.9 per cent and Canada by 6.4 per cent. D’Aguilar also noted that cruise growth was positive and stronger than expected in the first part of 2017, with an estimated 15.3 million visits; up four per cent over 2016. “There has been widespread coverage of the damage caused to these countries and territories, the most serious among them being Anguilla, Barbuda, the British Virgin Islands, Dominica, Puerto Rico, both Dutch and French Saint Martin and the US Virgin Islands,” the minister told journalists in London. “Understandably, this triggered a slowdown, with travel to many of these destinations having been severely impacted. 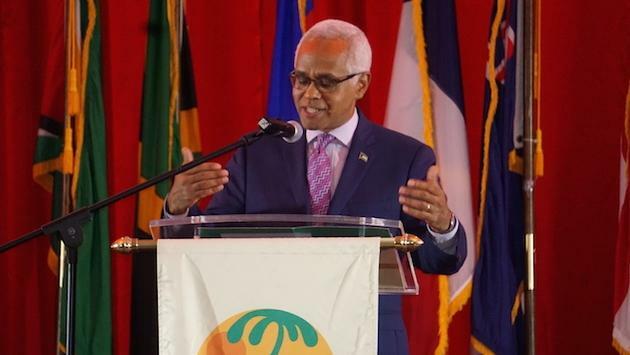 D’Aguilar said the drop will “have a significant economic impact, based on predictions by the Caribbean Development Bank.” According to the CDB every one per cent drop in tourist arrivals could cost $137 million US in lost revenue. A four per cent drop would mean a loss of about $550 million US; more than $650 million CA. Data provided by world airlines showed that in October the number of flights to the Caribbean fell by 6.7 per cent, while seat capacity contracted by 4.1 per cent, the minister said. The frequency of flights to Puerto Rico decreased by 25.1 per cent, Dominica by 13.7 per cent, St. Maarten by 12 per cent, the British Virgin Islands by 11.2 per cent, Anguilla by 6.3 per cent and the US Virgin Islands by 5.6 per cent. Seat capacity to all of these destinations was consequently adversely affected. Sint Maarten experienced a fall of nearly 50 per cent, he said. In a story featured on this site on Monday, Air Canada it has cancelled its St. Maarten service for the winter season. The minister said that the redeployment of cruise ships from damaged islands has benefitted some destinations. Curacao saw a 138.3 per cent rise in cruise in passenger arrivals in September, while Jamaican visits were up 54.1 per cent. But that doesn’t help folks in countries whipped by the winds of Hurricanes Irma and Maria. There has been considerable confusion in the marketplace, with some folks seemingly thinking the entire region was damaged. D’Aguilar noted that three-quarters of the Caribbean wasn’t even touched by the two big storms. As I said in an earlier column, you don’t have to go and build a house somewhere down there in order to help. All you really need to do is keep doing what you’ve done for years and that’s sell and visit those areas. Don’t shy away from recommending islands in the Caribbean, because judging from the numbers above, there’s clearly some misconceptions out there with the public that we all need to help clarify.